Well, today’s the final challenge of Book 3: Under the Sea. Like the other books before it, I am going to be very sad closing this one up for now and moving on. Although, I must say that next month’s book “Cats” is going to be lots of fun too! But for today’s project, we are focusing on our Under the Sea Sculptures (insert wild applause here). Please remember that these books are not going to be reprinted again. This being said, when they are sold out, they are sold out and there will be no more. Christi is going to be publishing many new books and in order for this to happen, her older books are retiring and will not be published again. 2016 EDITOR’S NOTE: Christi has released some of her retired books as “eBooks” in her online store. As with all the tutorials in the Friesen Project, please remember that these tutorials are done in an abbreviated format, with Christi Friesen’s expressed permission. 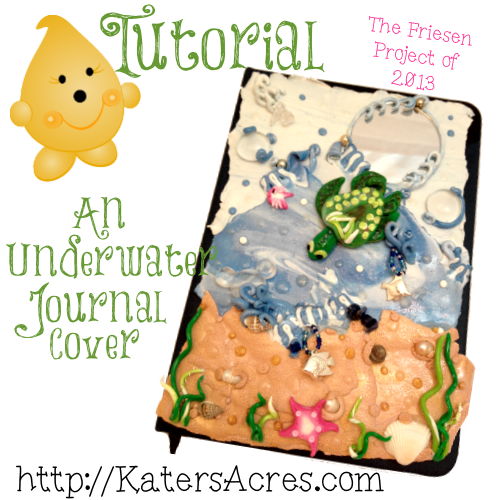 These tutorials are written and designed to be used in conjunction with the Beyond Sculptures Book 3, Under the Sea. Last week I asked each of you to “chime in” on what you’d like to gain from the project. The overwhelming response that I got from each of you was that you wanted “spin-offs” of Christi’s books and not direct and exact projects themselves. So, this being said … this week’s tutorial is a “spin off” using aspects from the book. Since I am assuming that most of you have the books, many details that Christi highlights will not be discussed in today’s project. Where details were used or are needed, I will include reference page numbers for you. I was asked last week by two individuals if the tutorial could be a PDF file this week as the project is larger and more involved than other this past month. So, without further ado, please CLICK on the graphic below to get your PDF tutorial file! Then download your PDF. That’s all there is to it. I chose only one artist this week. There are so many awesome sculptures this month, but I wanted to highlight how one artist has taken her own spin on Christi’s guides. These sculptures are truly her own, unique, fun, and fascinating. Way to go Laurie Grassel! Hi, just want to make sure I’m in on the tutorials. Love your work.